My parents (Earl Eugene Pyatt, 1922-2010 and Zella Stephens Pyatt, 1928-2009) met in 1947 at the University of New Mexico. They were both in the college band. My Dad played the tuba while Mom played the oboe. Their first date was when the band traveled down to Las Cruces for a football game and Dad asked Mom to the dance afterwards. My Mom had to borrow a prom dress from a friend and she and my Dad danced the night away. They rode back on the bus together. 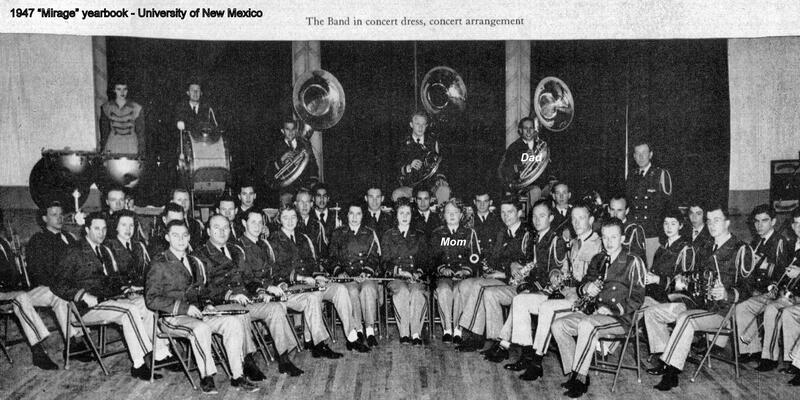 My Dad went on to get his degree in Music/Education and became of high school band teacher in Santa Fe, New Mexico. During their early marriage my Dad played with many different groups/bands…in the first home that they built there was a stage. Only after four of us were born and another was on the way did my Dad realize that he would have to find another profession to support this growing family. He returned to college and obtained his degree in Chemical Engineering. All of us kids played instruments. My Dad would compose music that we all played together. We attended weekly symphony concerts. He never lost his love of music. One of his most enjoyable times in later years was when my brother and I would visit him at his assisted living apartment and my brother would play classical music on the piano in the main entertainment room just for him. What a great post, and a lovely image of your brother playing for your dad.